Lock in a great price for Avista Hideaway Phuket Patong - MGallery by Sofitel – rated 8.6 by recent guests! Everything! Cannot fault one thing at this amazing hotel, from the main pool to the infinity pool, the rooms were amazing jacuzzi outside with just a phonecall to the staff to full it with plenty of bubble bath which is amazing on a night to relax with a drink! Food was really nice and drinks were very good! Staff were so nice and helped us on our travels. The free shuttle, location and the beautiful views. I love how the hotel was designed. The view was beautiful and it felt like we were staying in a castle. Excellent hotel and great staff. Location is a bit out but the views compensate for that. Design of the Jacuzzi Suite was awesome. Room views were awesome. Avista Hideaway Phuket Patong - MGallery by Sofitel This rating is a reflection of how the property compares to the industry standard when it comes to price, facilities and services available. It's based on a self-evaluation by the property. Use this rating to help choose your stay! Just a 5-minute drive from Patong Beach, Avista Hideaway Phuket Patong, MGallery by Sofitel offers guest rooms with air conditioning and private balconies. It features an on-site restaurant and 3 outdoor pools. Free WiFi is offered in the entire resort. Jungceylon Shopping Center and Bangla Road are a 10-minute drive from Avista Hideaway Phuket Patong. Phuket International Airport is a 45-minute ride away. A free shuttle service is provided to Jungceylon. Rooms at the resort are equipped with a flat-screen TV, a DVD player and an iPod docking station. Private bathrooms are spacious and offer a bathtub and free toiletries. Guests can enjoy fitness center facilities or relax with pampering spa treatments. Other facilities at the resort include a 24-hour front desk, a game room and a library. There is a tour desk to help guests with sightseeing arrangements as well. An extensive beverage service awaits guests at the resort’s roof top bar while offering views of the bay. The on-site restaurant offers selection of Thai, French, Italian, Australian, Indian and Chinese favorites. There is a barbecue terrace where guest can enjoy seafood as well. When would you like to stay at Avista Hideaway Phuket Patong - MGallery by Sofitel? Featuring a private plunge pool, the Executive Suite comes with both indoor and outdoor living areas. There is also an outdoor dining area and bathtub. This suite features a 40-inch LED TV, a mini-bar and a private bathroom with a bathtub. The multiple awards winning Avista Hideaway Phuket Patong is a luxurious Hideaway hill top Thai Village, just seven minutes from Patong amidst a tropical forest. Experience Thai hospitality, admire contemporary Thai architecture and unwind as never before in lush evergreen surroundings while enjoying spectacular sea views, authentic spa treatments and much acclaimed international cuisine. A Member of the MGallery by Sofitel, winner of World Luxury Hotel Awards and World Luxury Spa Awards. House Rules Avista Hideaway Phuket Patong - MGallery by Sofitel takes special requests – add in the next step! 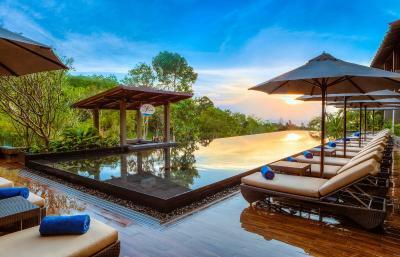 Avista Hideaway Phuket Patong - MGallery by Sofitel accepts these cards and reserves the right to temporarily hold an amount prior to arrival. Please be informed that there are construction works taking place in the vicinity of Executive Pool Suites until further notice. Guests are kindly advised to contact the property directly for more information. The property provides a free shuttle bus service to Jungceylon Shopping Center daily. The bus leaves every hour between 10:00-23:00 hrs. Guests are advised to booked in advance at the reception due to limited seats. Check in process really complex, and the arrangement of my room is horrible even though I have left messages in booking.com for a nicer arrangement of my wedding day. But the room smells bad, very dark, no view of outside. Worst stay during the entire trip in Phuket. Not enough sun beds around the main pool. Lack of dining areas next to the pool, they have meal offers at the pool bar but no where to really eat. The shuttle bus to Patong is incredibly poor, especially when considering the image of the hotel! Overcrowded, no AC or fans and very uncomfortable, so much so, we got a taxi on our last night. Lack of information on arrival, they have happy hour promotions at different bars however we were not informed and therefore only discovered some later (towards the end of the holiday). They provided us with no information about tours and their welcoming was disappointing! The room had cushions, which were supposed to assist your sleep but they smelt of body odour. The AC was loud in the room, they did offer us a different room however informed us it is due to the size and the AC unit they have so doubt it would make a difference. Too much noise from neighbors in room 202, throughout our stay. The only negative was that the restaurants and drinks were very expensive which meant they were empty most of the time so there was no atmosphere if you stayed at the hotel. However there was a free shuttle bus to Patong. Unfortunately, the staff was quite slow and inefficient. Sometimes no staff available, not responsive or our requests got lost. The air conditioning was very loud and quite slow. Impossible to sleep with the air conditioning turned on. The location is quite far away from everything with nothing nearby and the hotel's taxi service is quite expensive. Tri Trang beach is beautiful but quite a walk away. I did not like that every time I have to go out I have to use the electrical car, room was isolated becoues it’s dawen hill, did not like yo go for breakfast becoues of using the stares, I could not discover the hotel facility due to the High and low terrain of the hotel area.